Delivery time can vary by contact lens type and your delivery address. If you have any problems within three months of purchase, we'll put them right. The easyvision Lacrima multifocal allows us to prescribe a healthy contact lens choice without compromising on visual requirements. 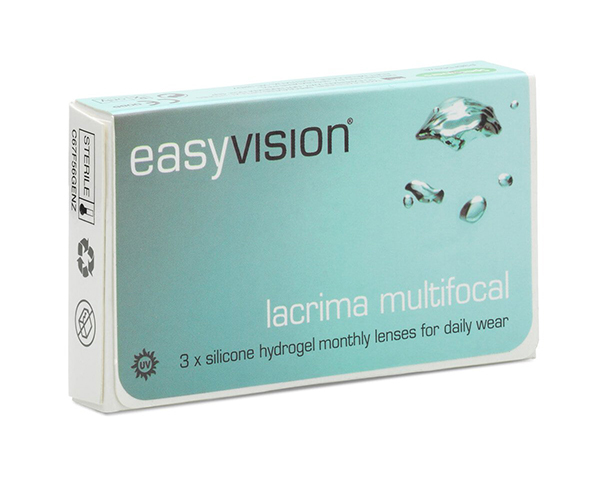 Unlike other reusable silicone hydrogel lenses, the easyvision Lacrima family uniquely combines a soft flexible material with a high water content to provide a contact lens that feels very comfortable, whilst high oxygen transmissibility ensures optimal ocular health. Need help? View our help pages or contact our customer service department by submitting an enquiry. If you don't have a valid prescription, please contact your local Specsavers store.